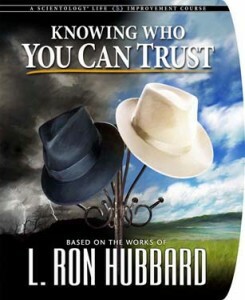 With Scientology breakthroughs that show you the true elements of human behavior, you can really know who to trust.Your survival depends on knowing who you can rely on. But how can you tell who your real friends are? How can you determine if a person will help make a joint venture successful?Is there a way to predict behavior? Yes. There are fundamental elements to human behavior. When you know them you have insight into your fellow man, and just by observing how people act, you will know everything about them. The important role of trust in human relationships. The Hubbard Chart of Human Evaluation—the tool to know true character and predict what people will do. How to evaluate others accurately and guarantee a more certain future for yourself and those you care about. With the knowledge you learn on this course, you will have tools to know who you can trust and who you can depend on. “In the past I’ve been too quick to make friends, and so at times I got involved with the wrong people. Now that I understand the Emotional Tone Scale and the Hubbard Chart of Human Evaluation, I have the technology to properly determine who I can trust.” V.J. “I really liked this course. I am able to use this data in my life to know who to associate with and who not to. I also gained a better understanding on the subject of Trust. I used to put too much emphasis on trusting people. Now I know what to look for in people and can trust them from that alone. No more worry and thinking about it all the time.” R.L. “Being a good person can get you in a lot of trouble sometimes, especially when you don’t know who to trust. The information contained in the course is basic enough for anyone to understand. It has influenced my behavior forever for the good. No more regrets or guilt when I turn people away who are no good for me. I can save time, energy and emotional pain now that I know what to expect.” S.P. Length of course is 7 days part time.